The lack of high-quality NCLEX prep currently on the market is the lead cause of exam failure. It’s also the leading reason for the 24/7 nightmare many RN nurse graduates have about losing a nursing career. As a nursing student, you already own a stack of NCLEX test prep, so you want the best 2013 review info that targets exam-like questions. You’re sick and tired of discovering dumbed-down questions and non-existent rationales in your text review. You need a strategy that will help you bust real Computer Adaptive Test (CAT) NCLEX RN review questions. That is, multiple choice and SATA (Select All That Apply) practice exams complete with rationales that reflect the actual test-taking experience. Most NCLEX exam preparation is rarely reflective of the actual test-taking experience for two-reasons: 1) They’re designed to make money, and 2.) They’re “fast-food” versions of the actual exam. In an online article published by Bloomberg Businessweek, many critics claim that big-name brands like Kaplan and Princeton Review are “fast-food” test prep. This means that these companies emphasize quantity-over-quality, and are too generic in their focus and instruction. In order to avoid the stumbling block of studying from “fast-food” test preparation, it’s important for nursing students to implement the “NCLEX-RN Prep Truth Meter.” This is a unique strategy that can help nursing students differentiate generic test reviews from truly outstanding sample tests and study guides. 1. Enter “NCLEX prep” in the search bar of Google Books. You should get a list of results based on your search terms, and some of them will contain brand names like Kaplan, Hurst, Nurse Zone, NCSBN Learning Extension, Flashcards and Princeton Review and others offering how to pass the NCLEX-RN – guaranteed. 2. Filter through the results to find the study guides and test-taking materials that interest you the most. Write a list of five to ten titles and put this list to the side. 3. Click to the first page of a potential NCLEX test prep materials purchase and check out the year it was published. If the latest revision was released more than two years ago, toss this study guide to the side. The RN exam developed by the NCSBN changes every year, so you need a study guide that will keep up. If the study guide fails to pass this criteria, cross it off your list. 4. Click open a new window in your Internet browser. Go to Amazon.com Books and type in the remaining titles on your list. Check out the customer reviews (these will be ranked from five-star to one-star). 5. Read the best book review, and then read the most critical review. If the words “generic,” “simplified” and “boring” crop up more than once, cross this option off of your list. This means that the test prep won’t provide you with any information you don’t already know. Once you’ve completed the steps in the “NCLEX Prep Truth Meter” technique, you should have a firm idea of what study guides will give you accurate NCLEX questions and rationales. What If You Used This Proven System To Find The Best Comprehensive Review? It’s easy to use the “NCLEX Prep Truth Meter” technique: all you need is to open your online browser and start researching via Google Books and Amazon Books. It’s a fast, effortless, yet incredibly revealing way to weed out the generic study guides that always leave you feeling frightened and uncertain about your NCLEX exam. Use this technique right now to get truly accurate NCLEX test prep. Think that you officially Can’t Pass The NCLEX? Wondering how you’re ever going to get through the sheer humiliation of telling your family and friends that you failed yet again? It’s time to STOP your career-crushing attitude thinking your can’t pass the NCLEX-RN. 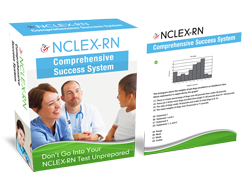 You need a study strategy that promises NCLEX exam results. No matter how many times you failed the NCLEX RN, here’s a study technique will help you put an end to the misery, pain and humiliation. What you thought was the best NCLEX-RN review class, study guide and practice test is a mediocre, extremely over-simplified approximation of your exam at best… If not, why do so many people struggle and even fail this registered nurse test, even after years in college taking classes in this professional subject matter? The “missing link” to your passing score is not necessarily the lack of NCLEX-RN review questions. Here’s a NCLEX-RN prep method that allows you set yourself up for success “up stream” vs. just doing your review at random. With that in mind, let’s take a closer look at how to pass the NCLEX RN exam guaranteed. Grab a pen and paper, or open up a Word Document on your computer. Create a table with four columns. Label each column with the following titles: “Safe and Effective Care Environment”, “Health Promotion and Maintenance”, “Psychosocial Integrity”, and “Physiological Integrity”. These are the four basic categories of client care that the registered nurse practice test will cover. Create several rows across the columns that reflect the amount of time you have left until when you have to submit your RN exam application. Label those rows with dates. Now that you’ve created a study calendar, it’s time to organize your study based on the four categories that the exam will be testing you on. Nursing educators recommend focusing on one category every few weeks; therefore, mark down which one you’ll be starting with. Remember, don’t focus on doing any other category in your prep for the NCLEX-RN until you’ve completed this one. Mark down your study dates for every category after that. Focus only on that particular category at one time. Nursing educators who skyrocketed their test score claim that focusing on one NCLEX category at a time makes the information clearer and easier to remember. WHAT IF YOU USE THIS TECHNIQUE NOW? If you’re wondering if this will really work, think of it this way: if you’ve failed the NCLEX RN more than once, then you need to shake up your study schedule. If you put this technique to use right now, you’ll be giving yourself the keys to NCLEX exam results that bring about jobs. You’ll realize you don’t have to freak-out like some test takers and say, “I can’t pass the NCLEX.” You’ll discover what it’s like to truly free yourself from the worry that you can’t pass the NCLEX – because you know for a fact that you can. Check-out my My #1 NCLEX-RN Review Tip To Pass And SAVE Your Registered Nursing Career right now.